Riot police clashed with protesters at a Lesbos rally against the EU’s migration policy. Some groups have warned that the island is “reaching breaking point” with thousands of refugees stranded by the policy. Riot police confronted protesters on the Greek island of Lesbos on Thursday who came out in opposition to the ongoing migrant crisis, which they say is disproportionately impacting their homelands. Police formed a cordon and fired tear gas to block the protesters, after many of them tried to push over a police bus. Clashes between officers and protesters lasted for more than an hour, although no injuries or arrests were reported. 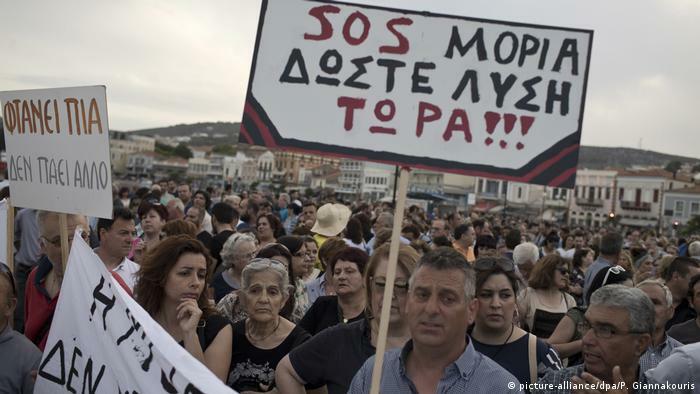 Thursday’s protest was part of an island-wide general strike to condemn a 2016 agreement between the European Union and Turkey that was expected to see migrants who landed on Greece’s shores returned to Turkey. Instead, some 15,000 migrants remain on Greek islands, including Lesbos, Chios, Samos, Leros and Kos, while their asylum claims are processed. Most of them are stuck in overcrowded camps as conditions worsen. Migrant support groups say a large backlog of applications has been created, leaving local residents frustrated as their islands are overwhelmed with newcomers. “It has gone too far. Every day buses (with refugees) arrive, and they’re full,” protester Yannis Vaxevanis said. Tension has surged again on the Greek islands as the number of migrants arriving from Turkey has risen sharply in recent weeks. It said some 500 new people were entering the island every week, overstretching healthcare and other services laid on for the migrants, while leading some to resort to violence. Last month, several people were hurt when far-right militants attacked migrants staging a sit-in protest at Lesbos’ main square. Tsipras promised that additional staff would be deployed to speed up procedures. In the meantime, the number of daily arrivals continues to rise, including 53 people picked up on Thursday from a yacht that ran aground on a remote beach in northeastern Greece.